Friday I made an orange pound cake and had the intention of pouring a Mai Tai over the top instead of simple syrup usually called for in the recipe. Something told me it may not soak all the way through so I devised a new plan. Since we had a dinner party to attend on Saturday night… I needed a dessert and put my thinking cap on. The result? 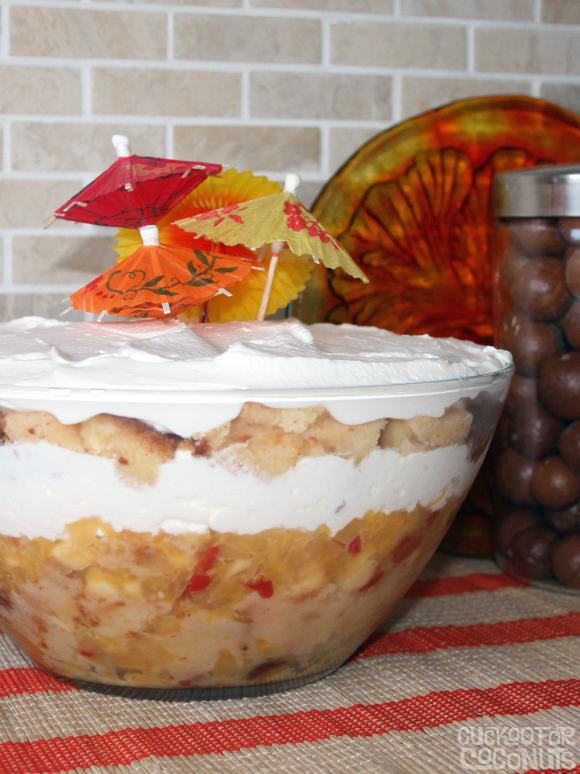 This Mai Tai Trifle. I like making the cake the day before as it give it a chance to set and dry a bit before soaking up the booze. Make sure your designated driver gets a small serving... or a to go serving. Hipahipa, cheers or bottom's up! 1. Preheat the oven to 350°F (175°C). Grease and flour a loaf pan. 2. Cream the butter and sugar in the bowl of an electric mixer fitted with the whisk attachment for about 5 minutes, or until light and fluffy. Add the eggs, one at a time, then the orange zest. 3. Sift together 3 cups flour, the baking powder, baking soda, and salt in a large bowl. In another bowl, combine the orange juice, sour cream, heavy cream and vanilla. Add the flour and dairy mixtures alternately in thirds to the creamed butter, beginning and ending with the flour. Toss the chocolate chunks with 2 tablespoons flour and add to the batter. Pour into the pan, smooth the top, and bake for 45 minutes to 1 hour, until a cake tester comes out clean. Let the cake cool in the pan on a wire rack about 15 minutes then immediately run a knife around edge to loosen and remove from pan. Allow the cake to cool completely. I used the Royal Hawaiian Mai Tai Recipe and tweaked it a tiny bit. A Mai Tai is a tropical drink made with dark and light rum, orange liqueur, orange juice, and lime juice. This is the original Mai Tai recipe that was created and made famous by the Royal Hawaiian Hotel in Waikiki, which is also known as the "Pink Palace". * denotes what I added or tweaked in this recipe. Make 3, 4 or 5 servings of Mai Tai listed above. I made 4. Depends on how boozy you want to be. Mix all ingredients in a small saucepan and simmer just until sugar dissolves. Remove from heat. You can also use 1/2 oz simple syrup in place of the sugar. Set aside until ready to soak cake. 1.Dice pineapple and reserve juice. Saute with butter and brown sugar until slightly golden. 2. Peel oranges over a bowl to catch juice. 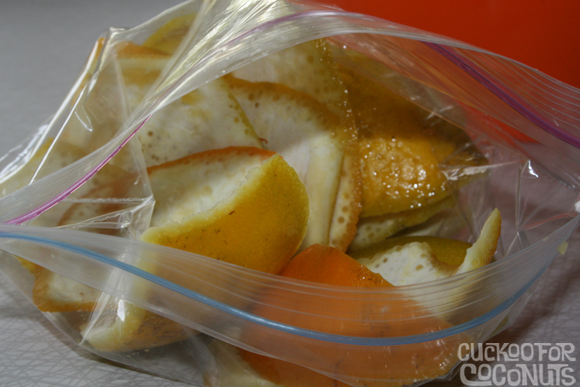 Remove all of the membrane on the orange sections so all you have are big pieces of pulp. 3. Chop cherries and add any juice to pineapple and orange juice. 4. Dice banana and add with all the fruit and juices in one bowl. Let sit about 15 minutes. Drain and reserve fruit juices. In a separate bowl add fruit and 1/4 cup Mai Tai mixture and let macerate 30 minutes. 5. Drain fruit and set aside. Reserve Mai Tai mixture. 1. 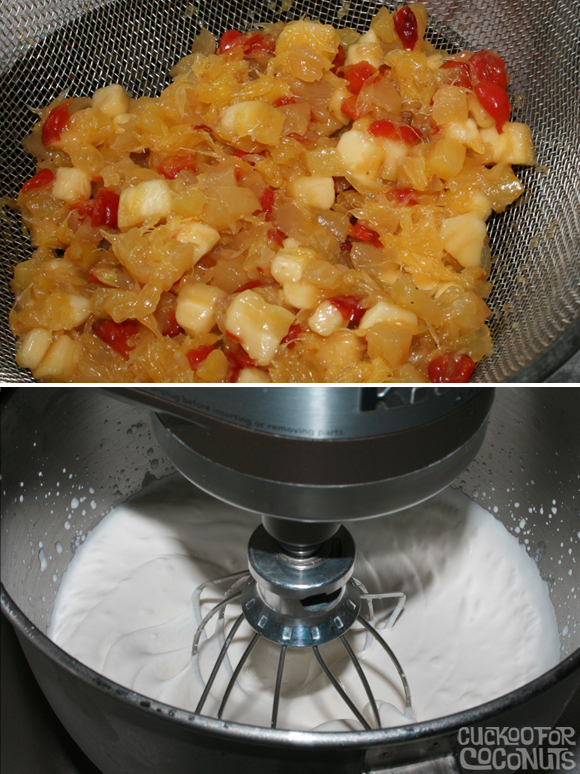 In an electric mixer with a chilled bowl and whisk attachment, whisk the 2 cups of cream until slight peaks form. 2. Add Orange Curacao and sift in powdered sugar. Whisk until firm peaks form on medium speed. Do not over whisk or you will end up with butter. Let cake cool. Preferably 1 day. 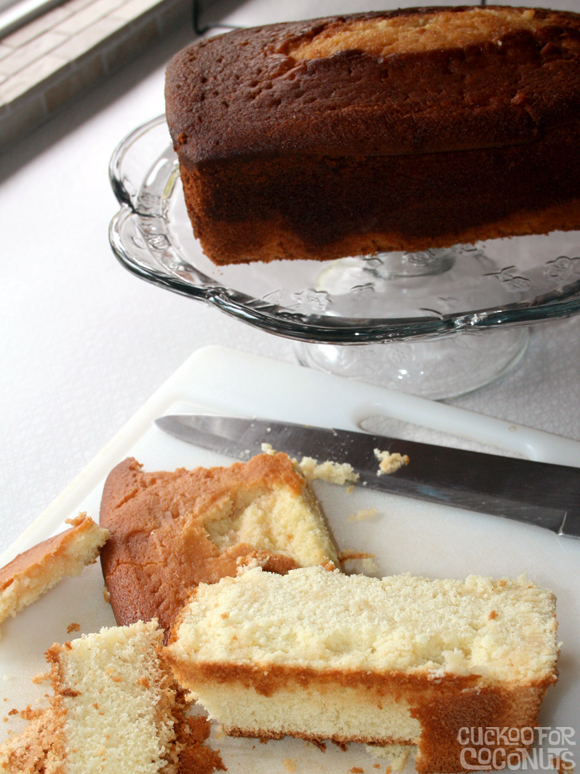 Slice pound cake into 3/4 inch slices. 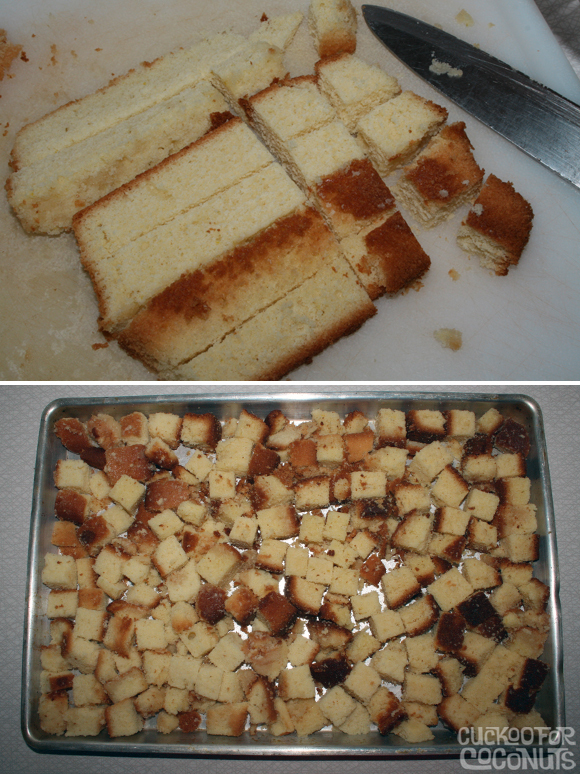 Dice sliced pound cake into 3/4 inch cubes and place in a cookie sheet. I only used about 1/2 of the pound cake. To determine how much you need, fill the bowl in which you are going to make it in 1/2 to 3/4 way full with diced cake. A little extra is fine since it will take up less room once wet. 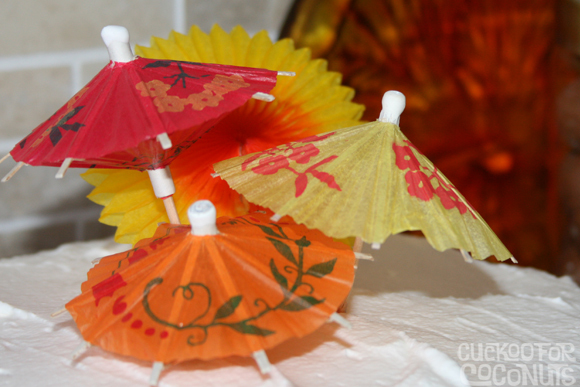 Spoon the Mai Tai over the cake making sure to hit every piece. Don't make it too wet or you will end up with mush. You can always add more if needed. Reserve about 1/4 cup for fruit mixture. You will be able to use this later. 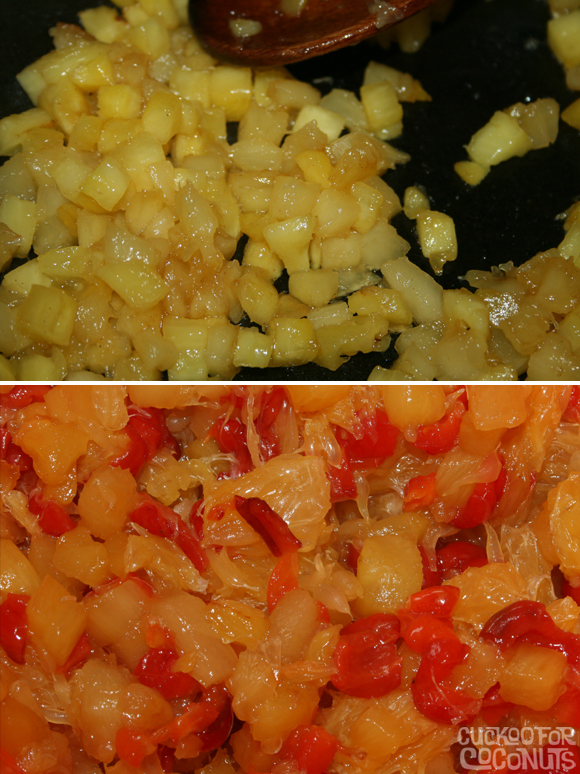 Saute diced pineapple in 1 tablespoon of butter and 1 tablespoon brown sugar. Mix with diced orange sections and cherries. This will make a lot of juice which you want to keep. 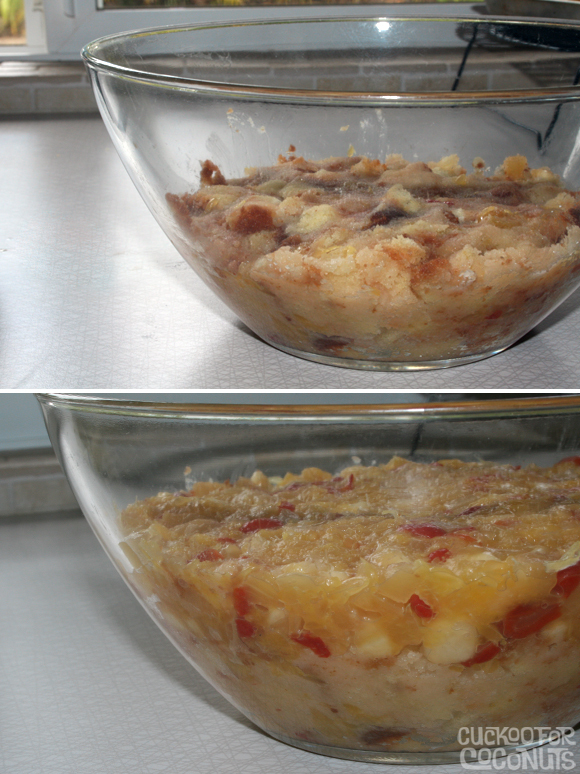 Toss into fruit mixture, 1 diced banana and drain. Place into a bowl and pour 1 Mai Tai over the fruit and let macerate 30 minutes or longer. 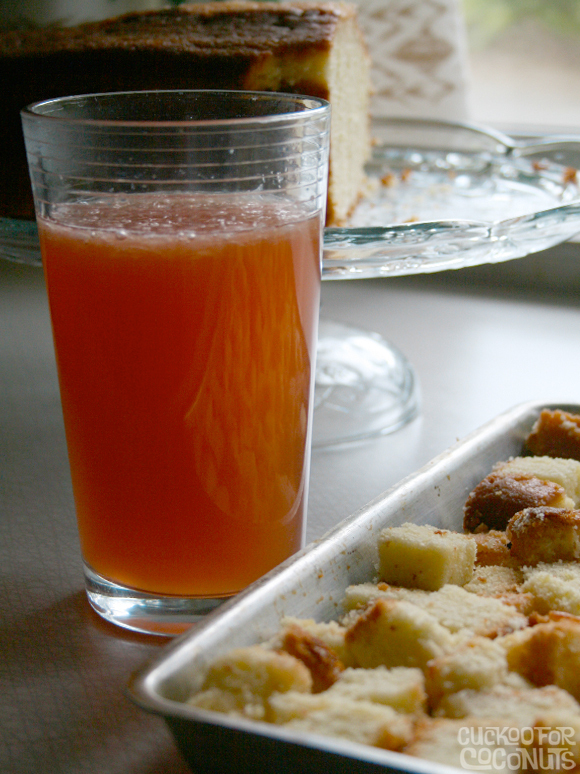 Drain and pour the remaining juice from the fruit and the Mai Tai used to soak the fruit in over the diced cake. Make sure to flip the cake pieces around in the pan before this last soak. If it feels too wet.. use your judgement as to how much more liquid to add. Make the whipped topping and chill until ready to use. 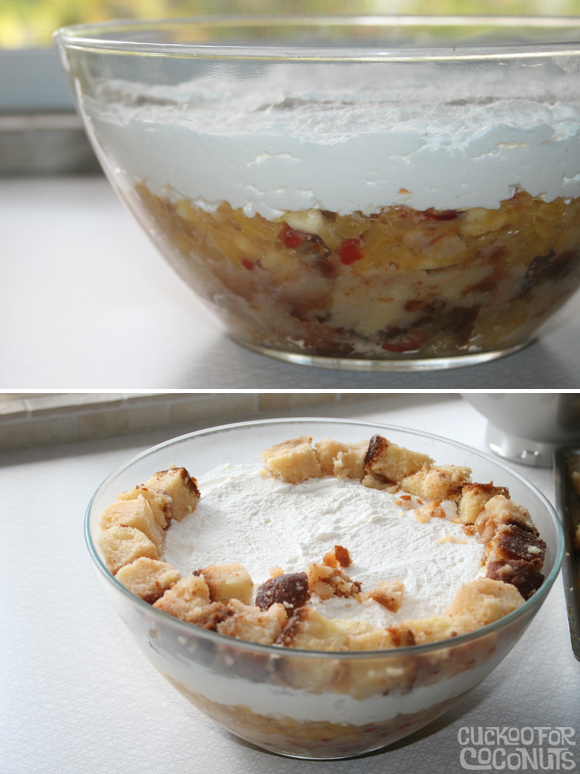 Press half of the diced cake into the bowl then top with all of the fruit mixture. It won't seem like there is enough fruit, but there is. Of course if you made this in a larger bowl… you could add more. Add half of the whipped cream and another layer of diced cake. Start by placing a ring off cake along the outside of the bowl then filling in... using all of the cake. Don't press to firmly on this layer as you do not want to squeeze the liquid out on top of the whipped cream. That would make it too wet. 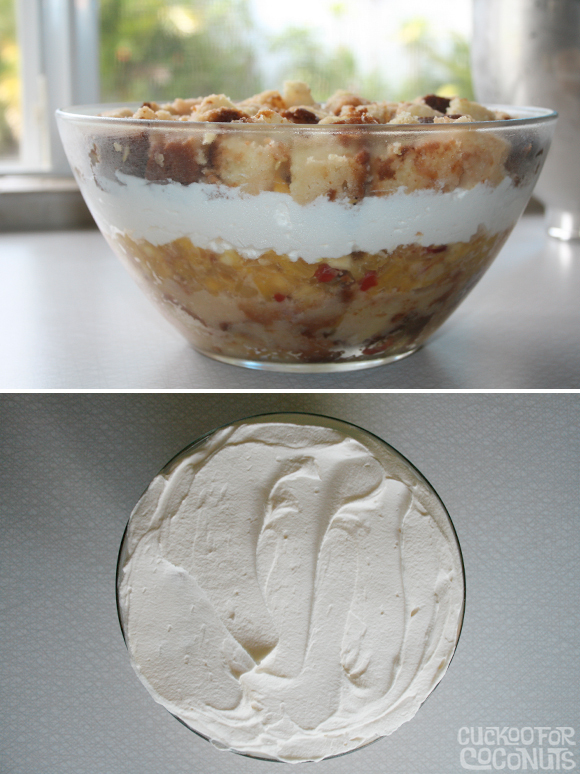 Top with remaining whipped cream mixture and refrigerate until ready to serve. Just before serving add an assortment of cocktail umbrellas. ...And don't forget... keep those orange rinds. Place in a ziplock bag and freeze. You can always pull them out of the freezer when you have a recipe that calls for orange zest.